Tom Dailey talks about his bid for a medal the the Rio Olympics, about distractions like school and TV work, and also his desire to do a course, such as Spanish. “Because I’m not doing any school any more and I haven’t got any TV shows, possibly I want to start a course in Spanish, sociology, politics, something like that, just to keep my mind away from it. It sounds like he should be introduced to the Open University; there were a few Olympic competitors on courses a few years ago. What could be more flexible? Is it a distraction? Is studying complementary to the day job or daily life? Any other competitive athletes out there? 3) In the case of French I’ve always wanted to, and at one stage needed to crack written French. Do you prefer to read widely or pick the brains of experts? Reading a history of the Armistice after the First World War – I’m a few years ahead of the centenary of 1914, I learn the Lloyd George preferred the former: picking the brains of experts was preferable to reading widely. Increadingly this ‘widely read’ person can have multiple degrees – learning online may be more expensive than a shelf of books but you emerge at the other end a wiser person? Being online affords a thousand opportunities to both read widely and to pick the brains of experts; what this requires is Web 2.0 literacy – the nous to drill deep when you read in a way that has never before been possible, unless, perhaps you have been privileged enough to have ready access to and the time to use one of the world’s elite libraries and your father or mother is a senior academic, government minister or captain of industry who loves to hold ‘house parties’ at the weekend. For the rest of us, there is now this new landscape – if not a level playing field (there are privileges based on cost and inclusion) – it is one where, with skill, guile, knowledge and experience you can gravitate towards and rope in the people and the books. Studying with the Open University ‘at a distance’ can be neither: if reading is tightly focused by the content provided and you are penalised rather than admired for reading widely: you are supposed to stick to the text as it is on this that your tutor will assess you. And the participation of experts is random: my seven modules with the OU has had some of the more prominent names of distance and open education as the chair and as tutors, some are present and make themselves readily available though some appear only in the byline or tangentially not taking part in any discussion or debate – it is their loss and ours. 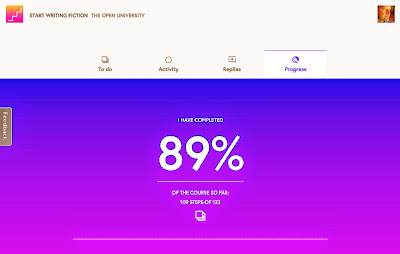 I sound as if I am denegrating the tutors as my expectation has come to see in them an ‘educator’ – not necessarily a subject matter expert, but a facilitator and an enabler, someone who knows there way around the digital corridors of the Open University Virtual Learning Environment. You get to know where to look: Amazon for books and the student forum that is the eclectic thread of reviews, then discussions in a specialist Linkedin group rounded off by webinars and hangouts. You may prefer one or the other but I suspect a balance of both is the most effective: you put in the information from books and you form your own opinions in discussions. Fig.1 Odd that, 12 years and I’ve gained hair, glasses and a tie. In February 2001 I began an OU module on Open & Distance Learning – last year I graduated with the Masters in Open & Distance Education (MAODE). Since then I’ve taken a couple more MAODE modules to stay up to date. Impossible given that any MAODE module is out of date before it goes live? The next direction has to be horizontally into the Open University (again), or vertically towards a PhD. Or both? Or neither. Meanwhile, I sincerely recommend that anyone with any interest in the way education is going to follow the BBC tonight. Is it an OU co-production? These days these things usually are. Why learning with the OU, indeed distance and e-learning, will always be constrained by the lack of ‘bonding’ between pupil and tutor. I am asthmatic. I recently attended an ‘asthma clinic’ – a one to one with a specialist nurse. We are able to get on the same wavelength because she recently completed her training on asthma and I have been preparing a PhD proposal that uses an e-learning platform to support people with a chronic illness – indeed a massive randomized controlled trial has just begun in the States. Its limitations are simple – in many instances we do a thing well in order to please another person. In tertiary education this means your tutor – in the MAODE we never meet, there are no tutorials. One tutorial a month in other courses, undergraduate and graduate at a residential, isn’t enough, IMHO, to establish adequate rapport. Where universities have a tutor system a life long friendship forms, especially where hard work is rewarded with a smile. I comply to my asthma and rhinitis drugs to please another human being – it happens to keep me healthy too. Personally, and of course it differs between people, I would do better in my studies for a smile. This makes learning French using Rosetta Stone, very limiting. As a teenager I did one of those exchanges – people smiled because I was an idiot who tried hard, my reward was lifelong friendship. Throughout my career I have relished the company of like-minds that comes from being part of a ‘trade association’. Since I was a teenager I was part of the IVCA – the communications industry and the extensive use of video in training and communications. Over the last decade, with the digital takeover and the demise of video in favour of faster, personalised delivery mechanism and smart learning online new associations have emerged. Personally, a Master of Arts in Open and Distance Education (MA ODE) has convinced me that video is a blunt, even bland and potentially forgettable and disengaging response to a learning need – well written text can be read at a pace set by the participant. I joined the ELearning Network doing a bit online and following various stories. Last Friday I joined 30 or so for a day long series of talks. I was impressed. It worked. Over the course of five hours there were five presenters – the format was engagement rather than lecture. It gave me the perspective of the industry I wanted as I contemplate taking my interest in an academic approach to the next step – PhD research. Where is the ‘smart e-learning’ and what can I isolate into a piece of original research that warrants three years of research and a 100,000 thesis? 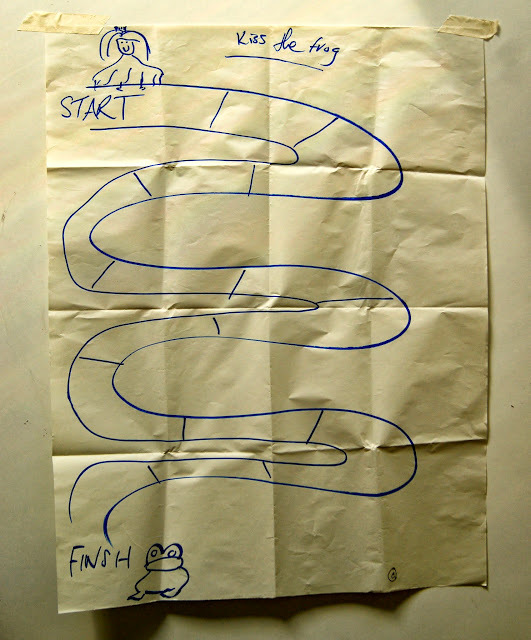 In the process our table invented a game called ‘Kiss the Frog’ where participants have to battle against the odds and each other to ‘kiss the frog’ – so that they too can become a frog and live happily ever after and a game to explain genetics in relation to colour-blindness. It has been refreshing not to blog for a month. It is easier to reflect. Had it become compulsive? A necessity to post whether I had something to say or note? Now qualified with a Master of Arts in Open and Distance Education am I inclined to be more circumspect and scholarly? Is this ‘jazz writing’ as I call it resistance to or an alternative to ‘proper’ writing, whether academic or storytelling. I miss what I have missed and the need to catch up. I have been busy with a trip to walk in and out of the old line along the Western Front at Ypres. 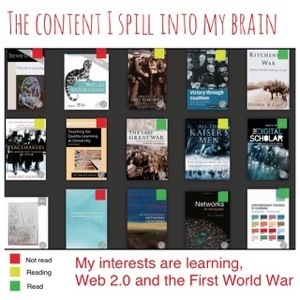 I have read copiously and widely on psychology, neuroscience, e-learning and history. I have seen a movie a day. On reflection I am better off WITH rather than without the regular habit of capturing thoughts and ideas as they are experienced. I gain from the e-portfolio, the aide memoire, if nothing else. Stumbling upon the work of Baroness Susan Greenfield, for example, prompted by a radio talk has had me reading her take on neuroscience. Often the messiest and most problematic of tasks prove to be the most revealing. Thinking of a group of swimming teachers as participants in some Open Learning was a challenge as some would never have used a computer at all. I thought of another group, nursery nurses and even contemplated going on to undergraduate medical students or junior doctors so that I could imagine working with a digital literate group but then returned to the challenge of introducing those with no experience of computers at all. Do you try to teach someone to swim butterfly when they cannot swim? Can a swimming teacher learn anything if they don’t have access to a swimming pool? This is what it felt like – clearly OER is never suitable for everyone – the learning outcomes must come first, then how to deliver these in a way that suits the participants. There’s a saying in advertising, ‘preach to the converted’ i.e. you are selling goods and services to people who want them anyway. The easiest ‘sell’ would be to create a course on digital skills for those who are just coming online and are eager to acquire the skills, rather than a group that includes those who have no digital skills and are even belligerent or disinclined to take any interest. Coming from Learning & Development we have sometimes been expected to ‘shoehorn’ other people’s content, or the client’s old content, into the production. We decline. We will use the material to inform the production process only. There is a reason, for narrative and continuity why I still feel that creating your own bespoke content is often a better alternative, otherwise there can be discontinuity, the need for writing in caveats, or simply reversioning as participants take a negative view of the smallest of things – say US English used instead of UK English. Just in time or applied resources and tools. Download and open PDF files. Locate Swim21, download the Code of Ethics PDF, email the Swim21 Officer to say that you agree to abide by these guidelines. Select a video on swimming technique from the Breakwater Swimming Website and note tips you would use in a training or teaching session. How to develop reflective skills and improve leadership techniques. Part of The OU course E113 Working and learning in sport and fitness. It was recently announced that a company had created a connector or ‘brick’ that allows those playing with either Lego bricks or Konnex to connect to two. It strikes me that OER requires some conformity in the creation of the learning resource in the first place to allow such bonds and that templates or connectors are required too. However, even if the learning resource is an idea expressed as a doodle with some text or a series of annotated diagrams from a whiteboard that are photographer and put online I believe this is far preferable to shoehorning another’s ideas into your learning design. Can you construct a new short story by lifting paragraphs from others? Can you construct original Shakespeare by mashing up lines from different monologues? Can you create a coherent painting by grabbing elements from a number of masters? This isn’t the same as the remixing musicians do, or is it? This isn’t the same as taking a cooking recipe and changing some of the ingredients – it is about the quality, truth, conviction, coherence and flow of a persuasive narrative. My greatest challenge is the nature of the intended audience, whilst ‘Swimming Teachers and Coaches’ is one way to define them, for most this is a volunteer role for an hour or so a week, for a few more a modest part-time and paid role for perhaps 6 to 8 hours and only part-time and professional for 3 or 4 – say 12-16, sometimes 22 hours a week. They are a disparate group too – from airline pilots and Doctors, to a retired postman and an assistant in Waitrose who left school with no qualifications and now understand that they have Dyslexia. One is doing an MA in Sports Science online, another gets his wife to receive and send emails – yet another her husband. This spectrum of digitally literate ‘residents’ to the ‘occasional visitor’ even the non-user – and in some cases belligerently ante-Internet means that to reach this group requires more group workshops, face to face applied ‘poolside on the job’ and hand-outs. Content online needs to be printable so that if necessary intermediaries can print off in specific fonts onto coloured paper for those with Dyslexia. Content in the post, the traditionally distance learning approach would be favoured by some. Links no longer valid or content removed, sometimes for declared copyright issues, such as here. Not having adequate input into the bespoke construction of the content in the first place, and then the possibility that the content may be removed is a problem. Several hours too late I gave up on the depositories. I have always found UK Gov websites very easy and clear, say for calculating and paying tax, or getting a Road Licence for the car. With the drive to have everyone on Universal Credit using the web – those in the community who are most likely also to have no or poor digital literacy skills or access, I wondered what training and support UK GOV offered. I was delighted with the ‘We Make Getting Online Easier’ website and feel that it would support those for whom using the Internet would be a struggle – how and where they get online is another matter if they don’t have an Internet connection at home, or a Smartphone. For continuity reasons I may then use this website through-out with the only venture away to look at YouTube ‘How to …’ videos relating to swimming teaching and coaching. I then checked the BBC and for UK residents found the BBC WebWise resources perfect. Start on the home page, run through the content bit by bit over the weeks. 70,000 years ago we were getting something right in relation to learning and responding to circumstances and left Africa. We have been learning in communities ever since. Perhaps population pressures or stability permitted reading and our inexorable desire to innovate led to the printing press and more since besides. Meanwhile populations and civilizations grew and society required or permitted the development of formal learning. For me all the learning theories are observations of human behaviour as individuals or in groups. Open learning is if anything taking us back to learning on the fly, in more vibrant less formal communities online. A response to the necessity of educating 7 billion and solving many of the human created problems on this dot in space called Earth. I rather think the theories come AFTER the event to philosophise over what is taking place – in a commercial and entrepreneurial world you get on with it. Take virtual worlds – they are commercial gaming and entertainment environments which educators would like to use and as they use them explain, position and justify. All I want to know is, does it work? If not ditch it snd try something else. Whilst there will always be one or two who cheat or those who are plagiarists, the results from ‘Big Data’ on open learning courses indicate that it can be a highly effective way forward on many counts. student assessment of their own work is even closer to the grade their tutor would have given with exceptions at opposite ends of the scale – poor students give themselves too high a grade and top students mark themselves down. ‘What are we like?’ indeed!